The acoustic coupling of Stephen Kent and Beth Custer sound out the Maybeck House. 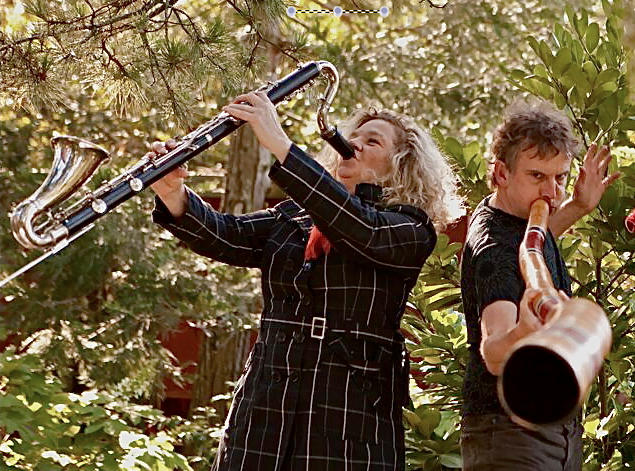 A unique combination: two world-class musicians, lips and reeds, roots and leaves, endless breath, flights of fancy, from farce to fantasy perchance to dream a deep trance dancing. Keening rawness the Bass Clarinet, the sophisticated Didjeridu, warm Percussion, Cello and the Piano too. Trance Mission Duo weave the light fantastic reprising the journeys that make them one of the most popular features of The Garden of Memory at Oakland’s Columbarium, and bringing new inspired works together in the moment. Here’s a chance to hear them up close and personal! Formed in the Mission in 1992 by Beth Custer and Stephen Kent the seminal 4th World quartet Trance Mission released four globally acclaimed albums over the 1990's and toured widely in the USA and also in Europe. 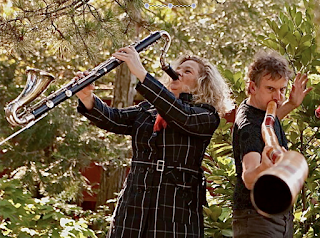 Celebrated San Francisco based clarinetist, pianist, vocalist and composer Beth Custer, a founder member of the Club Foot Orchestra, is an award winning composer of music for dance and film as well as releasing countless recordings with her own (now) sextet, The Beth Custer Ensemble, Clarinet Thing and many other projects. She travels widely and has performed her score of the banned Cuban film "My Grandmother" in Georgia (Europe) and New York & recently returned from an artists residency at the Blue Mountain Center in the Adirondaks. Multi-instrumentalist and composer Stephen Kent is one of the contemporary world's most celebrated virtuosos on the Australian Aboriginal Didjeridu. Beginning with the band Lights in a Fat City, based in London in the 1980's he has amassed a catalog of over 25 recordings where the Didj is a focal element. Most recently he has worked with the Del Sol Quartet realizing the works of Australian Composer Peter Sculthorpe. He also performs with the Sufi ecstatic dance band, Baraka Moon & has produced a legendary KPFA show, 'Music of the World' for over 20 years.